The manatees in Florida are the largest marine mammals that live throughout the state. 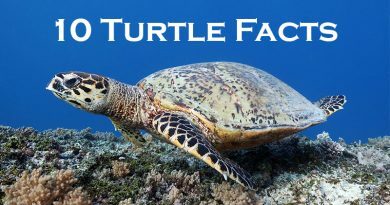 These slow moving gentle giants can be spotted in fresh water springs, salt water waterways and in the ocean all year round. 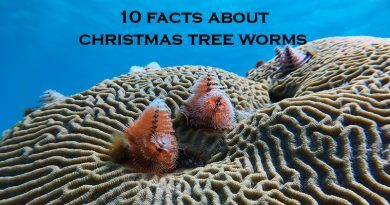 Would like to know interesting facts about how they live and where can you see them? 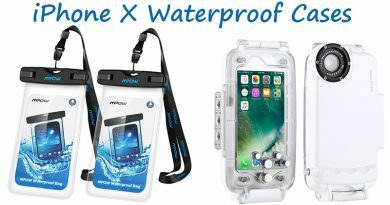 Learn everything from this informative article! 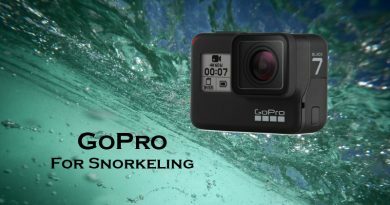 We also tell you the best places to swim with them! 4 What are the threats to manatees in Florida? 4.1 How to protect the manatees? There are 3 species of manatees: the Amazonian, the African and the American. The names refer to the areas where they live. The manatees in Florida are subspecies of the American, officially the West Indian Manatee. They belong to the order Sirenia which also includes the Dugong that live around East Africa, South Asia, Australia and the Pacific. Both species are often called sea cows. These round shaped head and flat tail animals are famous for their calm behavior and are absolutely not dangerous to humans. The Florida manatees population is about 6200 nowadays. Tip: If you are from Europe, Egypt is the closest destination to see a sea cow. Read where to swim with dugong in the Red Sea! They live in coastal waters all year round meaning technically you can spot manatees in Florida anytime. They tend to spend the warm summer out on the open ocean. But during the colder winter months manatee sightings are almost guaranteed because they stick to the coast to escape the cold currents and stay around until it gets warmer. You can see dozens of them between November and March. They seek shelter in the protected mild temperature freshwater springs and warm lagoons around power plant outflows. When springs arrives and the ocean starts to warm up, they migrate to the north. Their migration route from the north to the south and vica versa covers hundreds of miles and takes up to 2 weeks. During summer, they are present not only in Florida coastal waters but also around Alabama, Georgia and South Carolina. Some brave ones swim up to Maine! 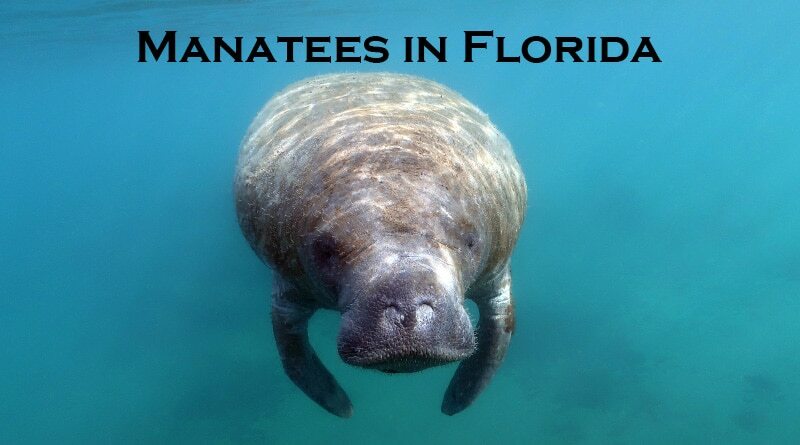 Good news is that during winter months spotting cute sea cows is possible almost everywhere near the cost in Florida. Keep your eyes open and monitor the water surface while walking near waterways, kayaking or paddle boarding. If you want to make sure to see them, there are some specific spots where they gather seeking warm water. These places are coastal power plants that cycle water to keep their system cool. 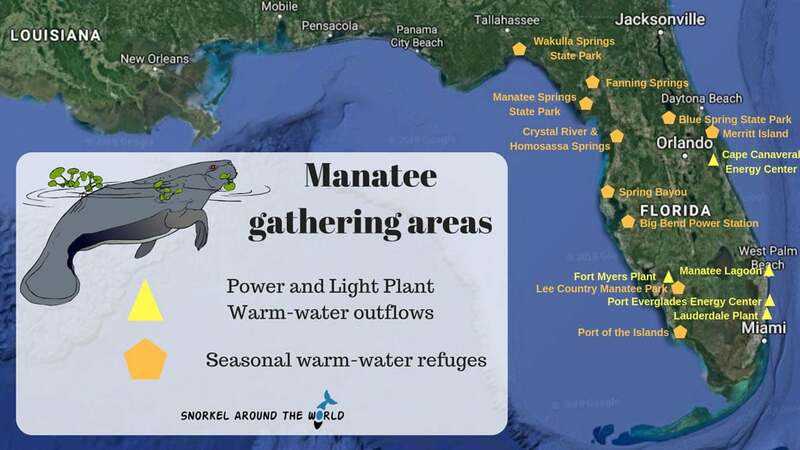 As a side effect of this process, they create warm-water outflows that attracts Florida manatees to stick around on the cold days. We highly recommend to visit the Manatee Lagoon in Riviera Beach. This nature center locates directly next the warm water outflow of the power plant offering the best view to observe massive adults and cute calves. They can be around all year round, but from November to March big groups tend to relax in the lagoon. Moreover, the Manatee Lagoon is an education center too where you can see beautiful manatee pictures and learn not only about this species but also about Florida’s marine life. 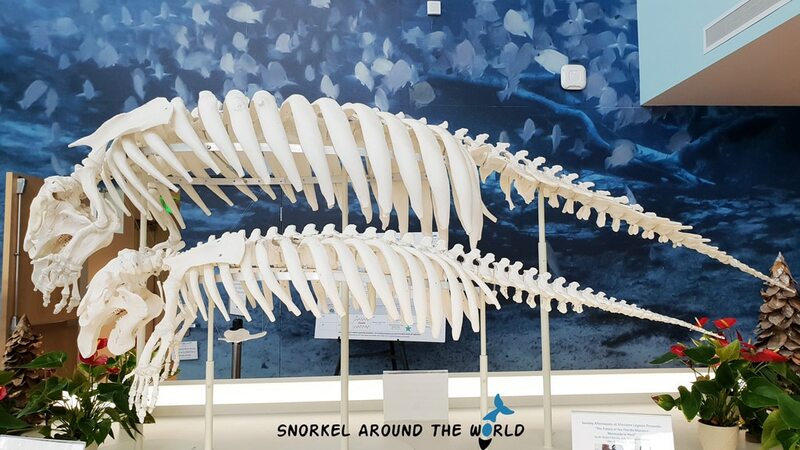 On the top of these, they even have manatee skeleton exhibited! These smart giants where to hide when the ocean cools down! Protected spring areas and slow-flowing rivers feature a relatively constant temperature providing ideal refuge for them. At these places, smaller populations present year-round but hundreds of them come together when winter comes. The Florida manatees are protected species and the law is very strict. To provide the species with safety and peace, swimming in most gathering areas is prohibited. Citrus Country is the only state where manatee tours allowed and you can legally snorkel with these peaceful giants. To join this unique experience, visit Crystal River where experienced staff will take you on a snorkeling trip to King’s Bay Wildlife Refuge or to Three Sister Springs. Another place where swimming is possible is Homosassa Springs. Of course, it can happen that you bump into a manatee while snorkeling in Florida. There are many beaches, parks where sea cows use to appear regularly and where in-water activities are possible even if they might be around. If you are looking for the best place to swim with wild manatees in Florida, we highly recommend the Peanut Island Park! This tiny man-made island close to the Riviera Beach Power Plant Manatee Lagoon is not only a nice place to enjoy a day on the beach, but also has a snorkeling lagoon that manatees use to visit. Moreover, there is a chance to see them at the nearby snorkel trail under Blue Heron bridge too. If you are lucky enough to swim with a manatee, act respectfully and follow the rules below! Intentionally or negligently acting against the protection law can result in fines and/or imprisonment. What are the threats to manatees in Florida? 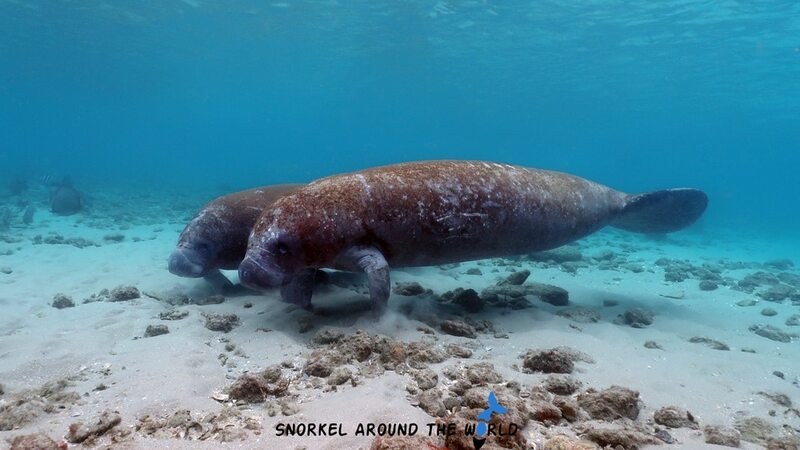 When in the water, manatees in Florida have no natural predators and they live in peace with all marine species including fish, reptiles and sharks. Their fragile habitat is threatened mostly by human impacts and indirect effects of man-made developments. Human impact: boat injury is a very common death reason by manatees. 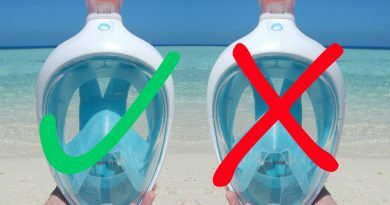 They spend most of their time is shallow water and come up to the surface regularly to breathe, therefore boat propellers can cause fatal injuries. 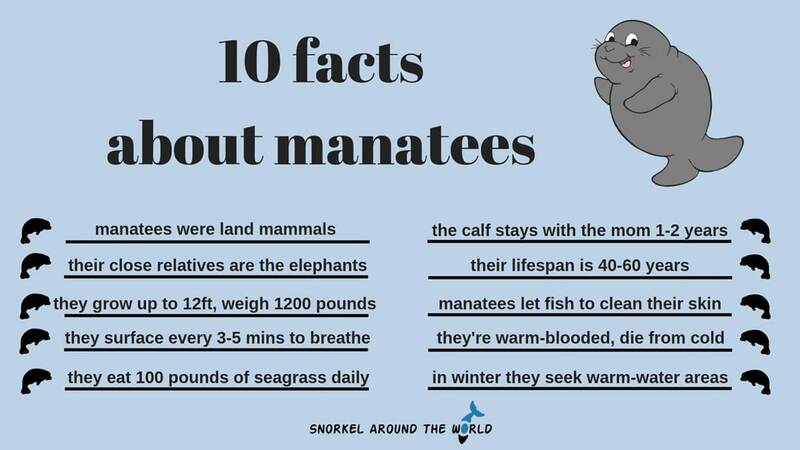 But humans kill manatees on indirect ways too: irresponsible fishing, coastal developments, waterways and canals blocking, pollution are just a few activities that lead to the decrease of sea grass fields and their habitat. Cold stress: they are warm-blooded mammals and when a manatee stays in water colder than 68F / 20C, it can lead to skin sores, malnutrition and even death. To escape the cold, they migrate to the south to seek warm water, therefore are common in Florida waterways during winter months. Weather: the Florida coast is often affected by storms as well as hurricanes. These smart gentle giants know when bad weather is approaching and move to deeper water. But these storms rearrange and cause damage on sea grass fields which are their main food supply. As a result, manatees lose their living spaces and need to move to new areas. Therefore it is important to protect sea grass fields around Florida. Red tide: karenia brevis, a microscopic algae can create a range of chemicals that are dangerous to marine species. The red tide is the bloom of this algae. 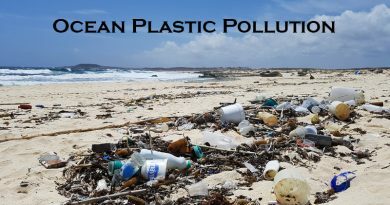 It spreads in the ocean making the water brownish-reddish and turning it to toxic due to the high concentration of the algae. The latest Florida red tide 2018 was one of the worst red tide recorded causing the death of thousands of species including manatees, dolphins, sea turtles and leaving serious impacts on residents and local businesses. How to protect the manatees? Weather catastrophes and irresponsible human behavior that included hunting too resulted a significant decline in the population. But since manatees in Florida are protected by law and conservation presents, their number increased exceeded 6000 to 2016. Lately, the Florida manatee was down-listed from endangered to threatened thanks to these efforts. But besides federal protection, individual behavior plays also an important part. Conservationists call Florida manatees umbrella species meaning protecting them will also protect many other species that share their living space with these gentle giants.